Sorry I was late in announcing Toronto City Hall’s New Zealand mosque vigil a couple days ago. 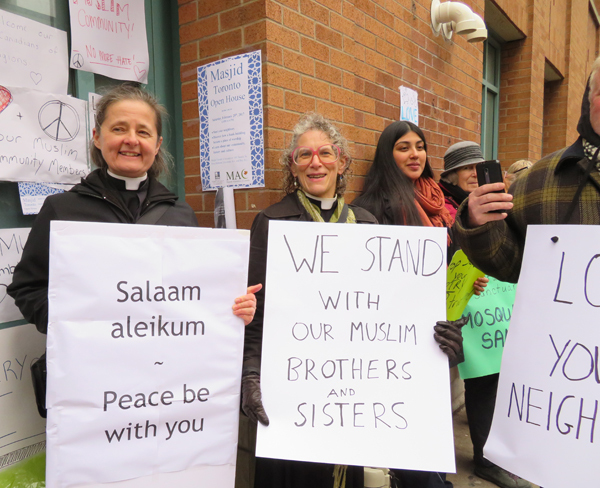 I just heard from St. Stephen in the Fields Anglican Church which was involved with the Ring of Peace at Masjid Toronto in February 24, 2017 after the Quebec mosque attack. From Toronto Board of Rabbis: Rings of Peace- Friday March 22In the wake of last week’s massacre at two New Zealand mosques, the Toronto Board of Rabbis is organizing Rings of Peace in locations throughout the GTA this Friday. Here is the list of locations and times. Please note that #13 is incomplete. Please check back for updates. P. Anne Winter sent me a link to a video of school children in Christchurch, New Zealand published in the Globe and Mail with the message: “Oh my Ruth, how fine is this way to be in touch with the pain sorrow and anger together.” A haka is a traditional Maori ceremonial dance, a challenge. https://www.theglobeandmail.com/world/video-new-zealand-students-perform-haka-in-tribute-to-mosque-shooting/. If you hear of other acts supporting our Muslim neighbours, please let me know. Ruth. ruthlormalloy@gmail.com. Featured image is of a rally in Toronto. Copyright ©2017 Ruth Lor Malloy. Dear Ruth, Thanks for the Ring of Peace March 22nd 1pm alert. Hi Ann, Please check my blog again. There’s a second Ring of Peace being planned. Ruth.